Home EVENTS NEWS This is our Agenda for Kiambu County; Waititu-Nyoro. This is our Agenda for Kiambu County; Waititu-Nyoro. 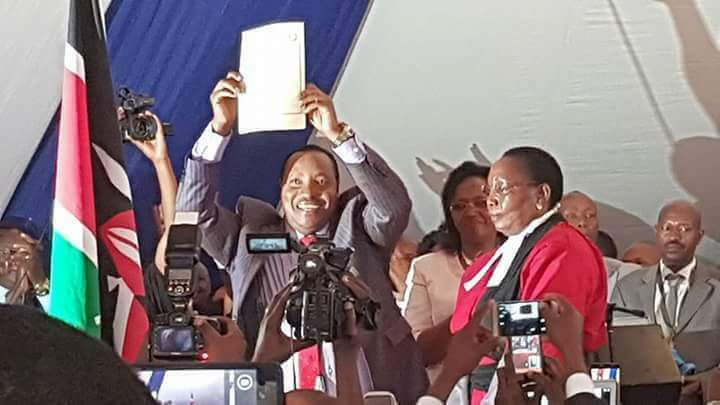 Ferdinand Waititu 'Baba Yao' displays his certificate as Kiambu governor after being sworn-in by Kiambu Chief Magistrate Patricia Gichohi in Ndumberi Grounds on Saturday. The incoming government of Governor Ferdinand Waititu ‘Baba Yao’ and his deputy Dr. James Nyoro has promised the people of Kiambu that the county will achieve an ‘inevitable economic transformation’ within their first five years. This will be through various economic and administrative measures that will see some drastic changes in the way things were handled. Acknowledging that about 60% of the county’s population depended on agriculture, the new government said that they will lay a lot of emphasis in this sector to ensure that they were food secure through sinking of dams for irrigation in the semi and arid areas of the county. They said that they had a major programme to revive cash crop farming to improve both production and marketing, especially for coffee and tea as they expanded the growing of macadamia and avocados among others whose demand in the international market was on the increase. “We will also set up a value addition factories so that pineapples in Gakoe and bananas from Ng’enda will fetch higher prices for our farmers. We intend to attract local and international investors who will, in the next 200 days, establish a world-class bacon factory in Kiambu,” said Dr. Nyoro. The new county government plans to build skills within the co-operative movement and ensure that they access adequate finances at affordable rates. The new KCG has promised to work with private investors to provide adequate and quality housing for 40% of its population who live in urban areas. They said that they would improve the street lighting programme, check on insecurity and address traffic congestion. All the major roads connecting economically potential areas will be tarmacked within the first one year in office. They also promised to embark on a rigorous programme to ensure all the rural access roads are upgraded to murram level. The new devolved government plans to take advantage of the basic infrastructure such as the Thika Superhighway, the proposed Standard Gauge Railway (SGR), Waiyaki Way and Limuru Superhighway among others to develop industrial parks that will help them create wealth and jobs for the youth. Other than this, they plan to ensure that they provide cheap internet connection for the youth to access online job opportunities from their own comfort zones. They also intend to develop a new crop of young entrepreneurs who will be providing services in water management, road construction and maintenance as well as cleaning the available markets. The Waititu government has promised to work with the national government and other stakeholders to ensure that they formed a common strategy for education that would help improve the standards of education from Early Childhood (ECDE) to the university level. “As a county government, we shall establish a revolving fund together with HELB that will make sure all college students access loans that will be recovered when they get employed,” said Gov. Waititu. Waititu said that his government will work closely with all stakeholders to improve on the county’s health services. He added that they will embark on a scheme that will see all residents were covered by the NHIF.